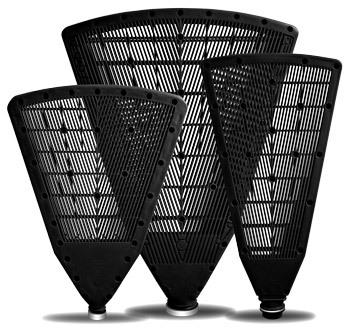 CASFIL’s plastic filter sectors are made of high-resistant polypropylene developed exclusively to the mining industry. In addition, the sectors are light weight and user friendly when compared to ordinary metallic sectors and complies with ISO 1800 ergonometric standards. Supports filter media perfectly. No angled edges to ensure better draining and longer working life. Quick sector assembling and disassembling. Eases maintenance. Ease filter disc assembling ensuring perfect fit with the other sectors. The edges are strategically increased to improve both vacuum concentration and cake release. Made of rust resistant plastic, the ring ensures perfect nozzle sealing. Patented polyurethane piece fixed inside the sector’s neck to avoid premature wearing by abrasion. Maintenance free - 2 years working life guaranteed.